Where RV Now? Where Amp I Now? This article is all about upgrades. Time and again as we've lived on the road, we've found that our camper's electrical system just wasn't up to the demands we've put on it. This is mostly due to our computers and satellite modems, and the situation was made worse by the power-hungry Toshiba laptop I bought in early 2003; this beast will frequently use 70 watts all by itself. The issue also stems from the nature of our traveling; we gravitate toward places without electrical hookups, so without such opportunities to recharge, we need to be electrically self-sufficient. And a truck camper just isn't designed for this, it's designed for using a weekend at a time, running a few lights and maybe the furnace, then taking it home and plugging it back in. 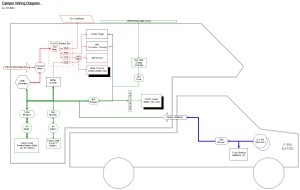 You can get an idea of our starting point (what the camper's stock electrical system was like), as well as the basic concepts we're working with here, from my original electricity article. 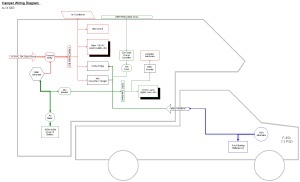 Here’s a wiring diagram of that initial state. That article also discusses early modifications I made to the system in the first few months. 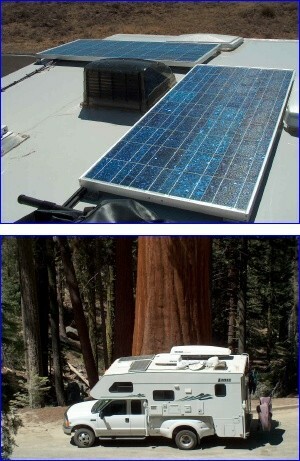 An in-depth discussion of our original solar-power setup can be found in my solar article. In mid-2003, after the upgrades discussed in the two aforementioned articles, our electrical system looked like this diagram. If you're feeling a bit rusty on your electrical concepts (volts, amps, and the rest), you might take a look at my electricity primer before going on. 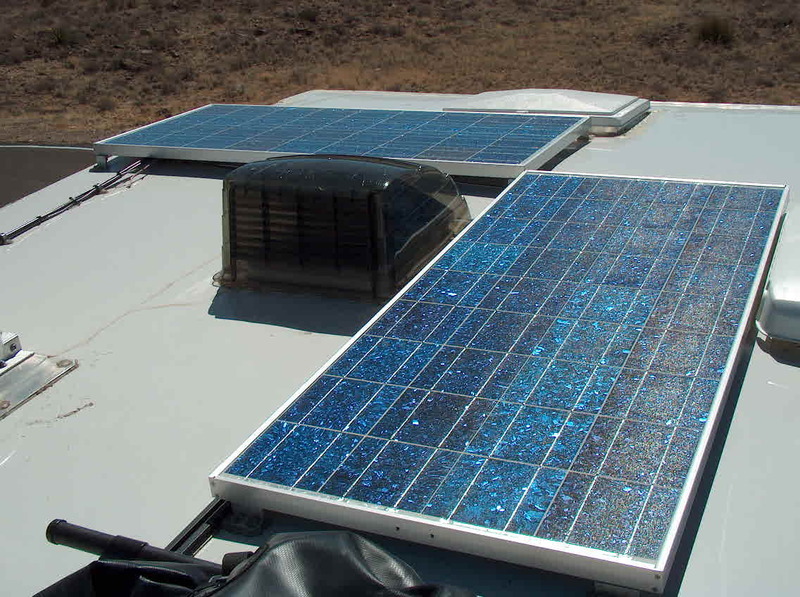 When I wrote my original solar article, we had two 120-watt panels on the roof, mounted in a location I wasn't very happy with. So the first obvious change was to move them to the front corners of the roof, where they should have been in the first place. This way they'd be out of the considerable shadow our DataStorm casts when deployed, and would free up more usable roof space as well: specifically, the problem with the original mounting location was that it blocked the only roof area where an air conditioner could be installed. So back in April 2003 when we came to install an A/C, one panel was moved. You can see the result in the bottom photo at left; the panel in question is the one that was in the foreground in the top photo. That small change actually held us for nearly a year, as we lived with our solar setup through all seasons and situations. What we found was that, under ideal conditions, our 240W would get us by - but that conditions were often less than ideal. More panels wouldn't go amiss, and hey, we still had a few square feet of empty roof… So up I went with my tape measure, and determined that we could shoehorn in both a 50W and an 80W module (sticking with our original panel manufacturer of Kyocera to avoid any voltage matching issues). I wouldn't have minded ordering them from ETA Engineering as I had our first panels, but before I got around to doing so we happened to pass through Quartzsite, Arizona, the RV snowbird capital of North America. Because so many of the 'birds boondock in the desert outside of town, and thus need electrical self-sufficiency just like we do, Quartzsite has what is probably the highest density of solar-panel retailers on the planet. One afternoon we visited half a dozen of them within a two-mile radius, buying the required panels from whoever had the best price. We also managed to get replacement panel-mounting feet for the ones that were rusting on us, as well as additional AGM batteries, 25 feet of 2-gauge welding cable, various other parts you don't find at your neighborhood True Value, and more connectors than you could shake a stick at. All that was left was to mount the new panels, and this I undertook one afternoon in Everglades National Park, Florida. All went reasonably smoothly, except for the loss of my 11mm wrench, which inexplicably turned up on our roof six months and 8000 miles later. The 22A charge controller we already had is just big enough for the upgraded array; the only other change I made was to swap the system's 15A fuse for a 25A. So now we have 370 watts of solar - and 0 square feet of available roof. Peak charging we've seen from it is over 20A, and we frequently are in the 15-18A range. 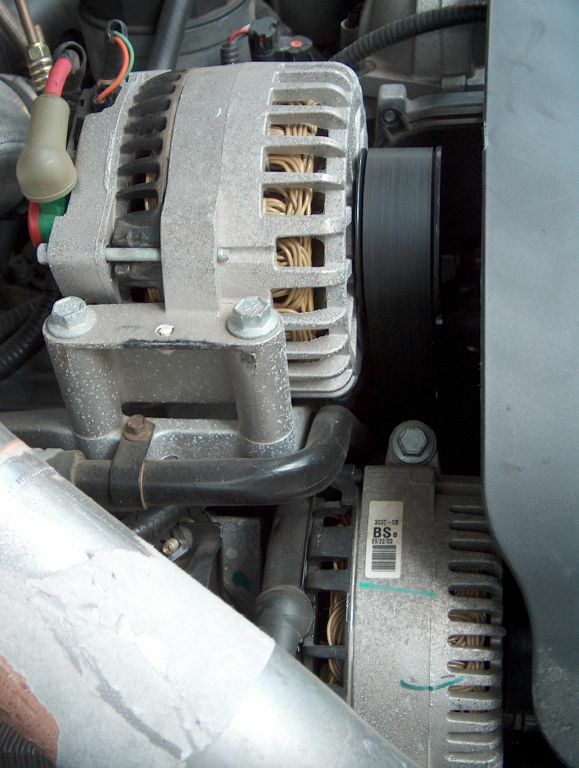 One option box we made sure we checked when we ordered our F-550 was "Dual Alternators". Ford thoughtfully makes this available for vehicles whose demand on their electrical system is heavy, such as ambulances and tow trucks, and it basically means just what it sounds like: it doubles the diesel engine's 12-volt generating capacity. How could I say no? Getting that electricity to where it's needed - the camper - was my next challenge. When Douglass wired our utility body for camper carrying, they used 8-gauge wire for the charging circuit, and this probably would have been OK for most folks. But not me. I could see that we were struggling to maintain a 20A charge rate from the truck, even when the camper battery was low, and I knew I could do better. Enter the 2-gauge wire purchased in Quartzsite. Man, I like 2-gauge wire. Thick as my little finger, resistance so low it can bring a tear to my eye. Back-of-the-envelope calculations told me that simply replacing Douglass' wire with 2-gauge and shortening the camper-to-truck ground run would net me another 0.2V, not stellar perhaps but still worth doing. So I did, most of it in a drizzling rain in Robber's Cave State Park, Oklahoma. And I was immediately disappointed. Truck charging was essentially unchanged. So out came my trusty voltmeter, and I started taking measurements at every point I could reach along the circuit. I quickly established that 14.35V at the truck battery was dropping to 13.0V at the camper amp-hour meter - some of which I could logically account for, and some of which I couldn't. And so began what Teresa likes to call "The Case of the Missing Volt". It turned out to be nowhere near that melodramatic, of course. Simply by removing superfluous links in the circuit and tightening up existing connections I found a good bit of it. But somewhere along the way, my plan became to upgrade as much of the circuit to 2-gauge as possible, from alternator all the way to back to camper battery. And with the exception of the camper's electrical umbilical (more about that in a minute), I have now succeeded, with the final links having been replaced here in Banff National Park, Alberta. The result? 13.6V showing at the camper end, and a charge rate that peaks over 90A before settling into a steady rate around 40A. With over 200A of alternator on the truck, I should be able to get even more, but I doubt I will pursue it further, for several reasons. First, the remaining voltage drop seems to be mostly in the camper umbilical. 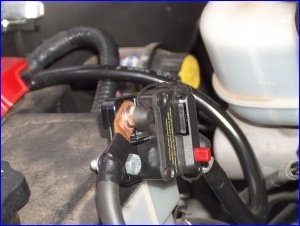 The only way to solve this would be to add a second, low-resistance plug purely for charging, and this would make detaching the camper more of a hassle - there's not much room there to get at another plug. Second, I've already reached the safe float charging voltage for our AGM batteries; any higher and I'd need to add some sort of smart charge controller to prevent overcharging on long driving days. But finally, it seems like we don't much need to; particularly in conjunction with our larger solar array, 40A from the truck is actually enough. One interesting side effect of this upgrade: We have a voltage-based battery separator in the camper, which means that it only completes the truck charging circuit when the voltage is above 12.8 or so. The logic here is that the voltage will be at this level only when the truck is running; when you turn the truck off, the voltage will drop, the circuit will open, and you won't drain your truck batteries with camper loads while parked. Well, the higher voltage we're seeing in the truck charging circuit now means that this separator will still see its threshold voltage for a while after the truck has been turned off, and not open the circuit until we've drained a bit of "surface charge" from the truck batteries - sometimes an hour or two after we've parked. It's not a problem, just another unanticipated consequence. Our camper came with room for a single battery in what's known as a Group 31 size, which means a bit over a hundred amp-hours, depending on battery brand. Now, solar and truck charging are all well and good, but there are still times that we're parked for days on end under heavy trees and/or clouds, and this requires a battery reserve. So more battery capacity has been on my wish list for a long time - but batteries are heavy, and piling more weight on our old truck just wasn't in the cards. Besides, where would I put them? Every cubic millimeter of space in the camper was already spoken for. 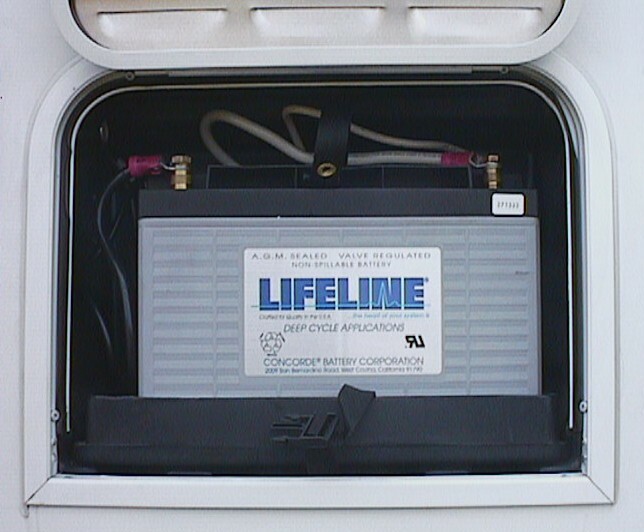 I've heard from folks who mounted additional batteries somewhere on the truck, but this has some disadvantages, chiefly that your camper loses access to the extra amp-hours when you take it off the truck. Then along came the F-550, and weight issues went out the window, along with some of our storage pressures. 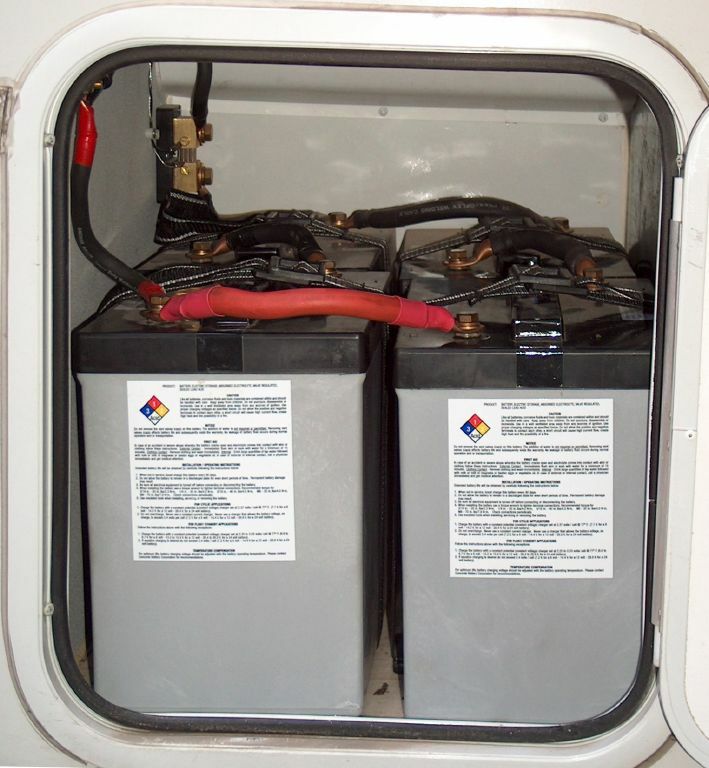 Before we'd even ordered the new truck, I had it worked out in my head: Empty one of our camper's outside storage compartments into the utility body, then refill it with honkin' big batteries. Sounds like a plan! The compartment of choice was on the starboard side, just forward of the generator. It had a nice solid floor, but best of all, there were already 2-gauge wires running from the existing battery to the generator compartment next door (mmmmmm, more 2-gauge). It would simplify the installation considerably: just extend those wires into my new battery compartment. 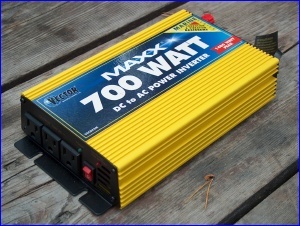 Measurements were taken, and a search began online for the optimal batteries to fill the space. Teresa and I agreed that we strongly preferred AGM batteries like our existing Group 31, she primarily for the safety, me for the maintenance-free and low-internal-resistance aspects as well. 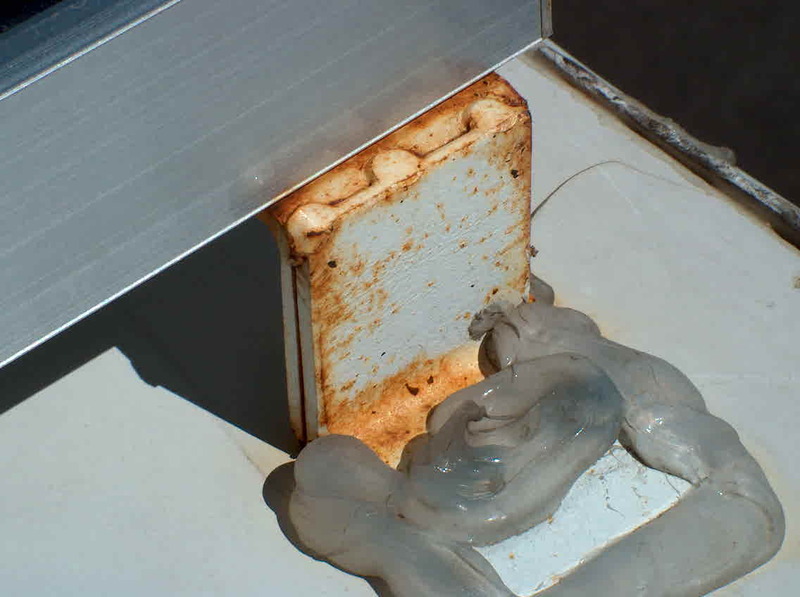 A nice bonus to AGMs is that we wouldn't need to vent the compartment. We could fit three more Group 31s in this space, for 315 amp-hours, but Lifeline also makes a 220 amp-hour, 6-volt AGM whose size is almost exactly one-fourth the floor space in question. That will do nicely… Wire a pair in series to make 12 volts, then in parallel with a second pair, for a whopping 440 amp-hours. Yes! The batteries themselves came from, where else, our stop in Quartzsite. Solar Bill made a bundle off us that day. Didn't get time to install them until we got to Florida, but that turned out to be a good thing, because there I could enlist the aid of my brother Eric's able hands and hammer crimper. Not to mention his car for several runs to West Marine and Home Depot, purchasing bits that had been missed previously. Several technical issues come up when expanding battery capacity like this. All batteries in a circuit need to be of similar size, type, and age, or the larger/stronger/newer batteries will discharge into the smaller/weaker/older ones. We didn't want to lose the investment we had in our existing battery, so I chose to leave it in place as a secondary bank, disconnected except when our new primary bank got low. It also occurred to me while laying all this out that two distinct battery banks would need independent monitoring. We had come to rely heavily on our system's amp-hour meter, and the best way I could think of to link in the new bank was to give it its own Link-10. Also purchased in Quartzsite, this was installed at the same time as the new batteries, and mounted right above our existing meter (which will stay monitoring the old battery). This has been our most expensive electrical upgrade, both in money and time to install, but it has been incredibly worthwhile. It was a huge gain, not the paltry 50% increase we've had in solar or even the doubling of truck charging but a fivefold multiplication of battery capacity. We have the reserves now to simply shrug when the sun doesn't come out, knowing that we can easily wait until tomorrow or the next day when it will. The only drawback is that our camper's stock 45A AC-DC power converter now seems too small. Back in the day, we could run the generator for an hour and boost our state-of-charge a good 30%. Now we only get maybe 10% from the same run time, and when our batteries are depleted, even plugging into shore power overnight isn't quite enough to fully top them up. With all this power, the only thing left to do was use it. Most of our usage demands are for 110VAC, but we'd been limping along on a portable 250-watt inverter that I'd had before we hit the road, running extension cords as needed to power various devices. This non-solution had been bugging me for a long time, and hard-wiring in a bigger inverter was the obvious course. 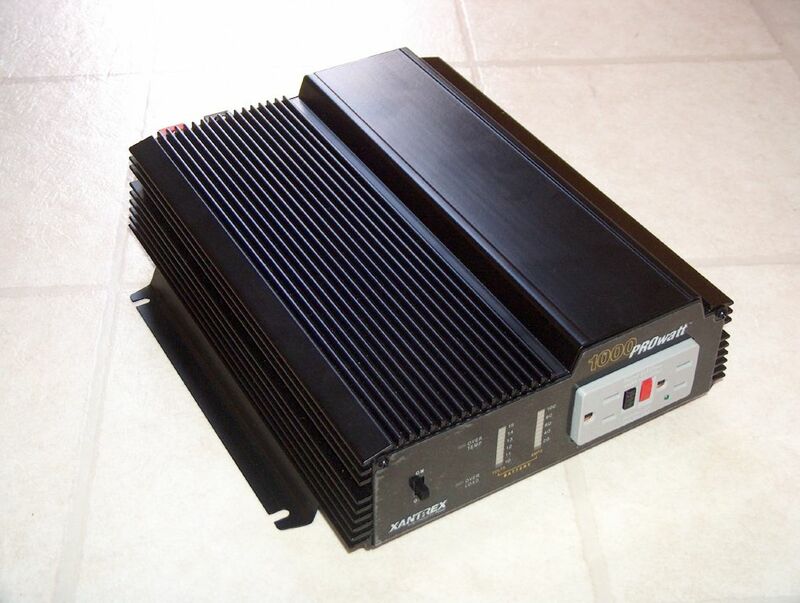 When it comes to inverters, you have a wide range of choices. At one end of the spectrum are the bottom-feeders you'll find for bargain prices at Wal-Mart or any truck stop. At the other end are multi-kilowatt pure-sine-wave monsters with integrated temperature-compensated three-stage chargers and automatic transfer relays that you'll need a second mortgage for. While these latter certainly have an appeal, they tend to be huge, and our space is still limited. Besides, we couldn't justify the expense - the much-cheaper modified-sine-wave actually works just fine for everything we want to run. So when I happened across a 700W Vector MAXX for $90 at Boater's World in Portland, Oregon, I bought it. Turns out I shouldn't have been fishing quite so near the bottom; when I got the DC side of it installed a few weeks later, I discovered that it had a cooling fan that was on - and making a racket - whenever the inverter was powered up. In a small space like our camper, this was unacceptable. It put me off finishing the AC side of the installation, in fact, and put me onto the search for a better inverter. This time, I set my sights on a Xantrex ProWatt 1000, at the high end of the modified-sine-wave group. I tried in vain to find one in a store for a while, but nobody seems to stock them, not even in Quartzsite. So when we arrived in the Florida Keys for a few weeks in February, I ordered one through West Marine in Marathon, then finished the installation with it in Ocala National Forest in the northern part of the state. 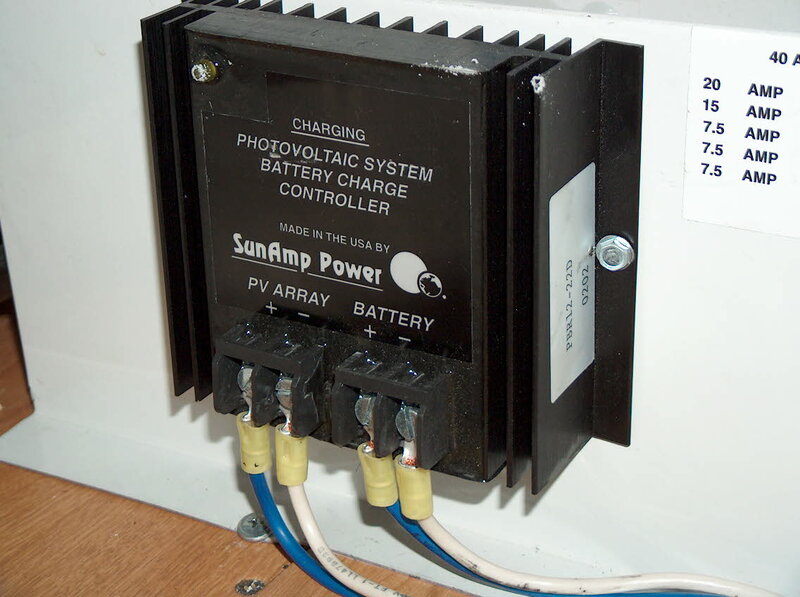 Now, most hard-wired RV inverters "intercept" the rig's incoming AC line with a transfer relay: when off shore power, the inverter supplies 110VAC to the coach, but when you plug into hookups, they switch themselves out of the loop. This is because connecting to more than one AC source at once has a nasty tendency to do very bad things - like blowing up your inverter - so you need a transfer relay to disconnect one source before it connects the other. 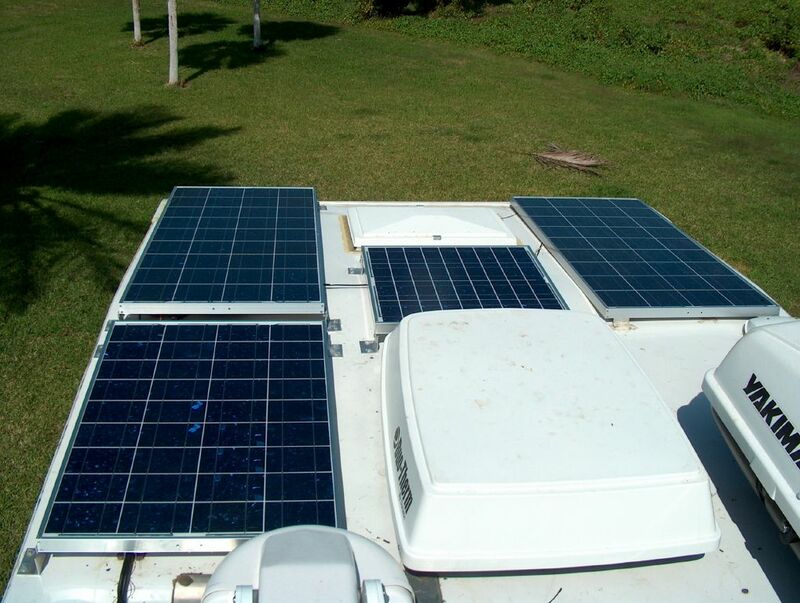 You could also accomplish the same thing manually by physically plugging the rig's shore power cord into the inverter when you want to be self-contained (many RVs do this with their generator). But whenever you did so, you'd need to manually switch off your AC-DC converter/charger, or you'd be trying to charge your batteries with juice coming from those same batteries. I was dissatisfied with this approach, and because we'd already ruled out an inverter with a built-in transfer relay, if I went this way I'd end up either installing the relay separately or going the manual plug+switching route. My alternate vision was to rewire the RV's AC system into 2 distinct circuit banks: the air conditioner, fridge, microwave, and converter/charger would be run solely from shore/generator, while the computers and other 110VAC outlets (meaning any other small loads) would be run from the inverter only. Why? Well, my major reason was that I need the satellite modems to have clean, uninterrupted AC power; a fluctuation in shore power or the genset going on/off would disrupt my Internet connection, and at the wrong time, this could actually be disastrous for my work. My approach effectively turns the camper into one big UPS: we have the batteries, we have the inverter, and now our 110VAC outlets are all electrically isolated from any vagaries of hookup or generator power. Naturally, this required some reconfiguration of the camper's AC system. Its circuits weren't laid out quite like I needed them to be; everything drew power from a single 30A main breaker. So here's what I did: I added an additional circuit breaker just for the outlets - our breaker box had a spare slot at the bottom, and conveniently, the outlets are on a separate line leading out from the panel. I then ran a new AC line from the output of the inverter to the "input" side of that breaker. To do this, I had to cut away the copper buss bar that would normally feed the bottom breaker; I did this with a Dremel tool and covered the stub with electrical tape. The breaker itself cost $5 at a hardware store (in Quartzsite, imagine that). At first, I hadn't planned to use this inverter to run our microwave oven, because its documentation says it draws 1400 watts. But after I had the inverter installed, I decided to give it a try - and to my surprise, the microwave ran, just in a slightly depowered state. My ammeters showed it to be pulling about 90A (at 12VDC) or about 1080W. This was handy to be able to run the micro from battery power; the drawback was that because I hadn't set up the modified 110VAC system to do this, we had to drape an extension cord across the kitchen whenever we did so. This got pretty old pretty fast, so I have now wired in a DPDT switch in the microwave circuit: when on shore/genset power, we can run it at its full rating, and the rest of the time, we can use it (at lower power) from our batteries. 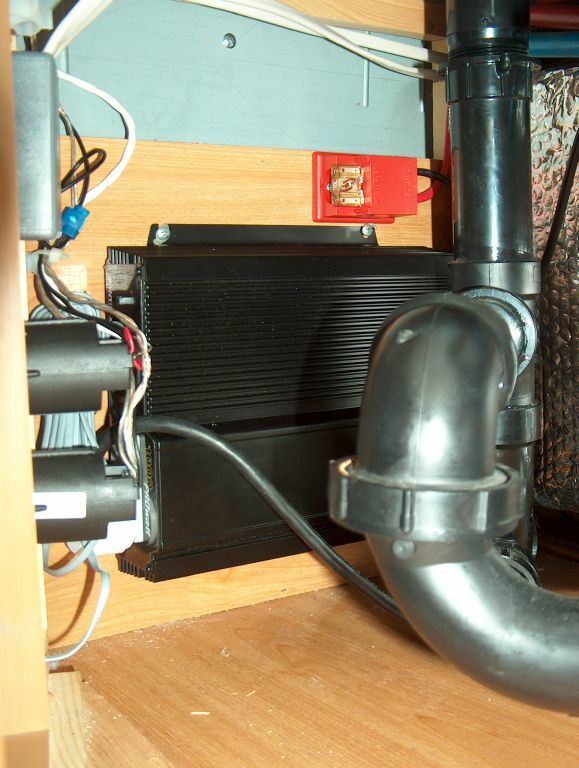 The inverter itself is mounted in the cabinet under the kitchen sink, very near where all the camper's wiring comes together. It's a tight but acceptable fit, and it minimized the run lengths for all wiring involved. 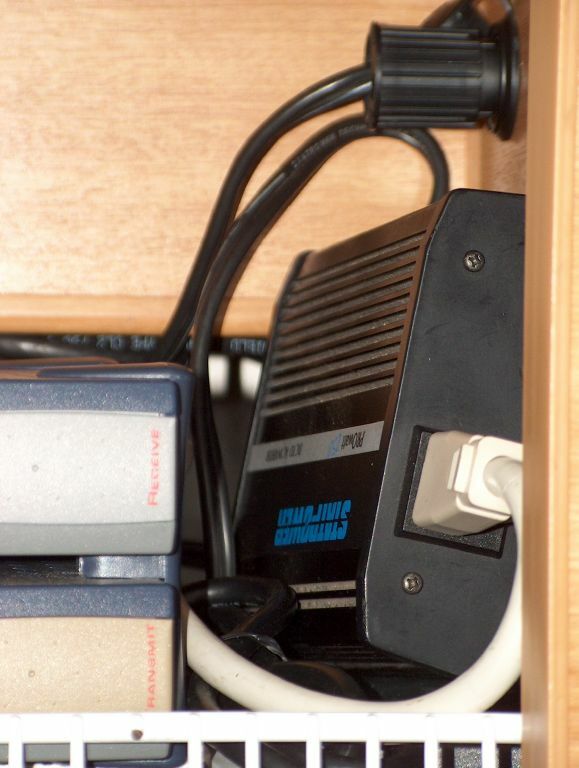 One nice feature of the ProWatt inverter is that it came with a remote on/off switch, which I mounted directly below the amp-hour meters in what has become our aftermarket electrical console. Had to trim it a bit to fit, but you wouldn't know to look at it. One not-so-nice feature of this inverter is that it still has a cooling fan that usually runs whenever the inverter has a significant load, or ambient temperature is more than about 75 deg F (24 deg C). I've since concluded that all inverters in this size range probably have such a fan. But this makes the remote switch extra-handy; we can easily turn the inverter off when we're not using it. And at least its fan isn't as loud or persistent as the cheap Vector's was. Also, the convenient off-switch makes it easy to eliminate phantom loads when we're not actively using 110VAC. Otherwise, I'm pretty pleased with how the inverter upgrade has gone. The only other issue goes back to what I mentioned earlier about the camper's 45A charger now being too small… This is exacerbated by having the camper's outlets run only through the inverter. If we're trying to charge our batteries by running the generator, but we want/need to be online while we do it, 10 of our 45 amps are now needed to run the 110VAC computers and modems through the inverter - even though the generator has 110VAC capacity to spare. The solution I'm planning for this is to add another DPDT switch like I did for the microwave, so when we need it, we can keep our full 45A for charging and just take the inverter completely out of the 110VAC loop. It's a pretty low priority, though; with all our upgrades, it's rare that we're that desperate for charging. We also now have the option of idling the truck (rather than running the genset) for good charging, and that's not current-limited in the same way. 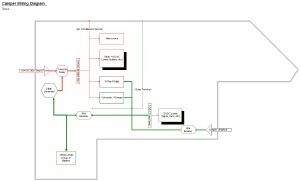 After all of the above was completed, the state of the rig's electrical system is graphically summarized in this diagram. One recurring theme throughout these changes has been the challenge of doing this degree of work without a home base. There are many levels to this… For every piece of work, we need to find a place where we can actually do it, preferably someplace dry. We need to carry all the required tools with us, or make do with what we have (a hammer crimper of my very own is on my Christmas list). We need to anticipate all parts needed, because a mid-project run to AutoZone is just not practical from many of our campsites. We need to plan around the work, because while I'm trying to work on the camper, Teresa's trying to live in here too. And probably most difficult, we need to find the parts. Most of these components are relatively obscure: while your average Ace Hardware has the screws needed for mounting a ProWatt 1000 inverter, they certainly don't have the inverter itself. As you've probably noticed, Quartzsite was a godsend, but more typically we've had to mail-order items (always a hassle) or try to track them down as we pass through one town after another. I've learned a few things doing this… Marine stores are a pretty good bet, since boaters face many of the same challenges that RVers do. 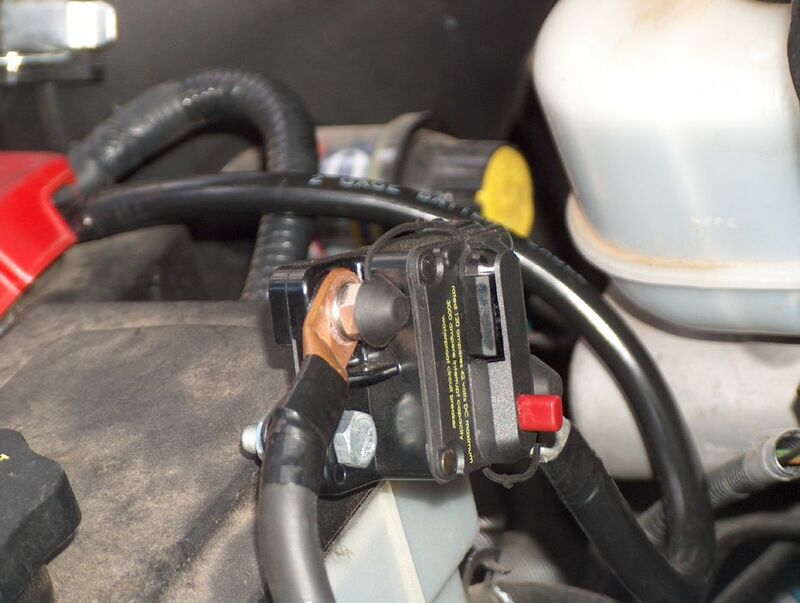 And auto-parts stores are more helpful than you might think; in particular, I've found that most NAPA stores seem to carry good-quality heavy-gauge cable and connectors, you just need to ask for them because they keep them in the back. So where has all this effort gotten us? Well, as always with camper upgrades, the bottom line is our fulltiming quality-of-life, and in this case, Teresa and I agree that it has improved markedly as a result of these modifications. Much of what we do from day to day involves electricity, so having an ample supply give us more freedom in what we can do, be it as simple as turning on adequate lights or as advanced as watching downloaded movies on the computer (something we're still sorting out, by the way). These additions have also made us more self-sufficient, so we have more freedom to travel; electrical hookups have essentially become a thing of our past. About the only drawback is that the entertainment we used to get from watching the amp-hour meter has become a bit abstract; it no longer matters to us like it did, it has become almost academic. As for me, I'm finally pretty well satisfied with our rig's electrical system - finally! While I'll probably be fiddling with it for as long as we own the camper, the high-priority items have now been marked off my to-do list. We have the electricity, we have the self-sufficiency, and with 545Ah of battery and 370W of solar, I can hold my head high whenever the campground conversation turns to electricity. Where UR now: Home » Notes » Where Amp I Now?